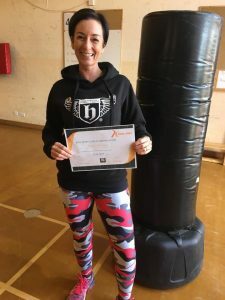 “I’m Tracey and a Personal Trainer since 2010, I have recently passed the KSFL coach programme. I was lucky enough to have the spare time in my day to set aside a few hours a day to study . The information was so helpful and I have learnt a lot from it to help women in the future who come to me for support. My plans for moving forward are to continue instructing my classes one of which is Hatton Boxing and with the added bonus now of KSFL to offer to my clients . Giving them the choice with healthy and achievable results following the programmes . The programmes will be available online and I will also be adding into my class schedule the 30 min express workouts for the girls to come along and join me in a class which is based at The Racing Centre, Newmarket, Suffolk. Thanks Tracey we wish you all the best with your classes! Click here to learn more about becoming a Kick Start Coach. Education and Business Training For Forward Thinking Fitness Professionals Who Want To Offer Online Kick Start Programmes or use the Kick Start Programmes And Re-brand the Content for your own Business. Use all of the Kick Start programmes or use the content and material and brand as your own. HOW TO CREATE Your ONLINE Fitness Business Course.